How much is it worth? It's in good condition. Encyclopedias only have value if they are complete and over 100 years old. Yours has very little value. Unfortunately all this tells you is it sold and that the actual selling price could have been 1 cent to 1 cent under asking price...with or without shipping. I suggest checking back to eBay (to the SOLD auctions only) periodically to see what they fetch on average to help you decide if you want to sell yours. They are heavy and that makes them a challenge to sell/ship even with USPS media mail. As a true thrifter...I always find ways to get some value out of the seemingly not valuable or hard to sell. If your intent is to sell and you are at all artsy...and don't mind deconstructing books....there are folks do well making lamps out of old encyclopedias OR deconstructing them and framing and selling some of the neater or more unusual pages. There are so many neat things you can do with old books. When I was very, very young, my (now late) dad hollowed out an old book and that is where he kept his "valuables". Years later, I saw similar "safes" selling on Etsy for in the $15-20 range! I hope this gives you some ideas for "value"! 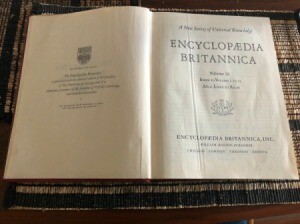 Some years/editions of encyclopedias can have value but they are very slow to sell (at almost any price) and expensive and difficult to ship safely. eBay is the best site to check for value as you can see what sets actually sold for. This year - 1961 - does not seem to have anything outstanding in the contents so it will not be very sought after. Some sets have distinctive maps, photos, or events that may be favorites of different age groups. there are usually different types of bindings that can sometimes make a set more valuable. The two sets on eBay - one sold for undisclosed amount and one still for sale - appear to have different bindings but not sure that really counts for anything in the edition. One big question about listings on eBay, Amazon, and other sites is: how long have these books been listed before they sell or if they sell? Sellers on these sites usually leave books listed until they sell and that could be months and months or years, and, they may never sell. Many of the eBay sellers will list their sets as "pick up only" which means they will not ship and buyer must live in the area or close vicinity. Some sellers will "piece" these books out and sell by one volume instead of a set. I did see single books for sale for $6 to $11.50 each. If you wish to sell your set, you might try listing on Craigslist, LetGo, 4Sale, IOffer or any other local selling site as sometimes people will buy if they do not have to pay a high shipping cost.